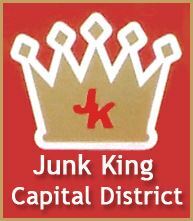 Welcome to the Junk King Capital District official blog! This blog will be one of our primary lines of communication to our customers, friends, fans and anyone else who is interested in our Junk Removal services. Be sure to check in for frequent updates and news about our affordable, efficient and eco-friendly junk hauling services for the Capital District of NY, which includes Albany, Columbia, Duchess, Greene, Montgomery, Rennsselaer, Saratoga, Schenectady & Ulster Counties. We’re expecting to launch our hauling business in the next week. Also, be sure to check out our official Capital District NY Junk Removal Page page for more information or call 1-800-995-JUNK to book an appointment ahead of time. This entry was posted in Albany Junk Removal, Junk King Capital District and tagged capital district hauling, Junk King Capital District, junk removal albany on October 12, 2011 by Todd Porter. Last updated August 1, 2017 .